$100 is not a big deal these days, especially if you want to buy an excellent pair of speakers at a competitive price. 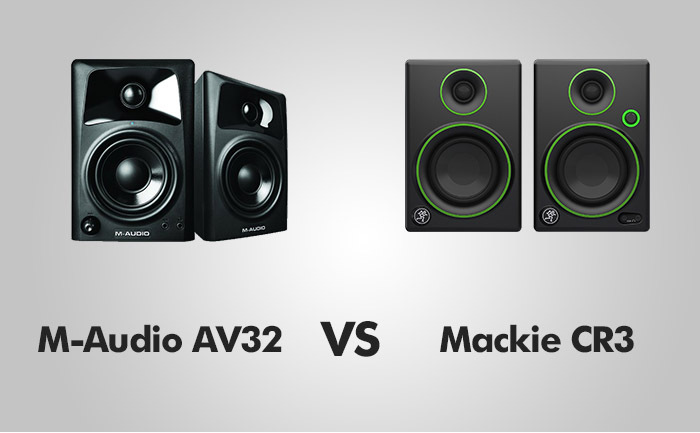 But given a choice to buy either M-Audio AV32 or Mackie CR3, which one could be the best pick for you? Let us compare the two models to find out the best among equals. The comparison is based on its salient features as well as performance. In M-Audio AV32, a 1-inch textile dome is built inside of a waveguide. In its close competitor Mackie CR3, the tweeter measures a ¾ inch. A small waveguide is comfortably seated in the baffle cover made of plastic. The ultra-green ring is slightly raised to style up the look. The feature also deters possible edge diffraction. The tweeter has its back covered by a makeshift enclosure, held by hot glue and staples. I’m confused why the manufacturer wastes so much time for the back part but then I assume they have done so to prevent air leakage via the front baffle. The woofer in M-Audio AV32, with a coated paper, resembles a cone. It comes with a butyl rubber surround and closed cell foam designed for the dust cap. The driver, as claimed by the company, is 3 inch though, in reality, it measures 3.5 inches. The poly cone woofer measures 3.5 inches. The dust cap is inverted despite the CR3 having no grill for its exposed dome. Recessed mounting is another striking feature of its woofer to catch my attention. In AV32, the baffle is made of plastic whereas wood is used for the cabinet. The rest of the cabinet is covered by the vinyl coating. That feature along with the baffle texture is a common issue if you are buying a pocket-comfortable speaker having wooden components. CR3 features a near-perfect matte texture with vinyl coating and the look perfectly matches the black plastic baffle cover flaunting matte finishing. The well-built cabinet looks smart and sharp. In AV32, the port is 1.25×4 inch in diameter, which is much bigger than what I expected. Port tuning is up to expectation, in fact, more than that. CR3 has a 1.25-inch port with the depth of 3.5 inches. The firmly attached port has a higher tune, at least higher than my expectation. The amplifier in AV32 resembles a single chip. You can easily spot the wart transformer, which is small in size and yellow in color. One of the speakers sports a plate lamp on its back. The amp has both types of connectors for rear inputs. However, if you want to use pro gear, there is no way to switch to the setting of lower sensitivity. You can easily place the powered speaker on any side – left or right, which is a nice touch. No wall wart power supply for the speaker! The flipside is you cannot remove the power cord. No grill in either of the two models! In CR3, the bright colors circling the drivers serve as a warning signal for you to maintain a safe distance. Let us now come to the main part, i.e. performance. Treble sounds not good and gets hot. I felt that the sound hit either behind me or next to me but never in front. For speaker sound, AV32 scores high. The sound feels smooth and excellent if compared with other speakers coming cheap on the pocket. The pretty clean amp is a good feature. Unfortunately, low volume is its serious limitation. In CR3, the treble runs hot but the elevated bass does the balancing act. A very bad studio monitor – yes, that is what comes to mind if I think about it. Cone breakup sound is intolerable and harsh. No lower bass is there and honking upper bass is not a feature to boast of. If you are curious to know the big draw of CR3, I cannot help but mention its cone breakup. With less and on a low budget, AV32 is really great. However, they have several downsides and one of the most severe is that it’s not getting loud enough. I would never suggest anyone to use CR3 at a party or mix sound with it. That’ll be a horrible experience for you.